In our little corner of the Preschool world, we have been studying the letter d. Here is what we have been up to! Originally, I was going to take one piece of artwork from each lesson to make into an ABC book for Malachi, but I decided I would make a scrapbook with with all of the photos I have taken and samples of his artwork, handwriting, etc. During reading time, I had Mali point to the words that begin with the letter d. Then I asked him to recall words from the story that begin with the letter d.
Vocabulary words in this lesson include doll, duck, dice, dog, dinosaur, dish, dive and dig. This is the last letter of book B. We will move on to book C, Go for the Code next! 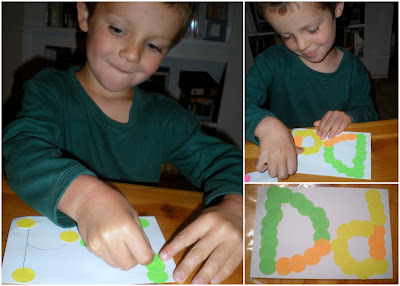 I drew a capital and small letter Dd on a piece of cardstock, and gave him a sheet of neon dot stickers. 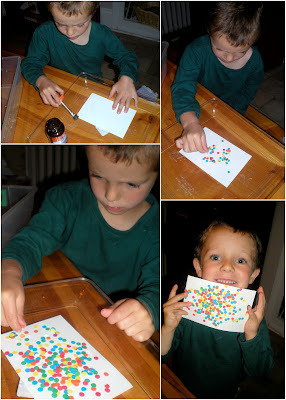 These are the dots we made when we made holes for the letter h. Mali glued them to a small piece of cardstock. At first he put them on one at a time (there is his little personality shining through) but the glue was drying too fast, so he finally added a little more at a time. His job here was to make a diamond collage. 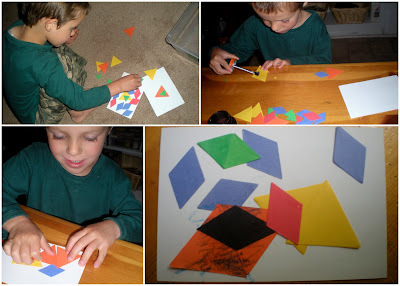 I gave him various colors of diamonds made from construction paper and a few triangles. He had to put two triangles together to make a diamond. At first he played with them on the floor. Then he sat at the table and glued them onto a small piece of cardstock. 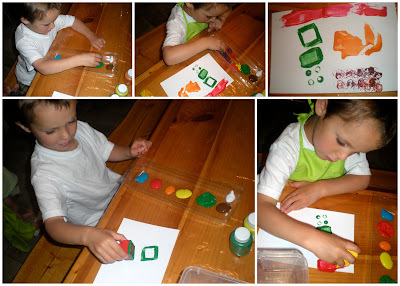 Duplo blocks made for a fun painting tool. He was delighted by how each side made a different imprint on the paper. 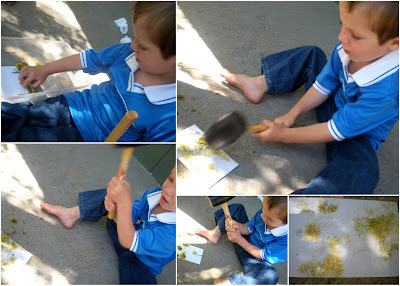 After collecting some dandelions from the yard, Mali used a rubber mallet to make dandelion prints on a piece of cardstock. Digging in the Dirt - an activity that Mali does on a daily basis. We have a lilac bush in the back yard and beneath it is a shady spot with lots of dirt to dig in. When I am low on spoons, I know where they are! I need to give him a supply of old spoons so he stays out of my good ones. This would have been a good time to practice writing the letter d in the dirt! 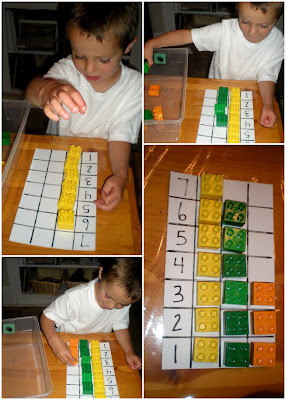 I put various colors and numbers of duplo blocks in his box and he graphed three colors at a time. Then we practiced reading a graph - which was more, which was less, etc. We counted the dots and matched a few of them end to end. Then Mali made a long snake with them. 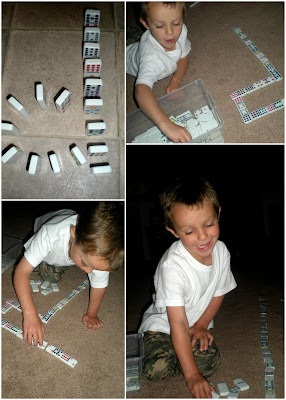 I made him the "d" to show him how dominos fall. Be sure to stop by Our Homeschool Creations to see what others are doing at the Preschool Corner. I love the Duplo activities!!! Painting with duplo, I love it! Using the mallet with the dandelion looks like a lot of fun. I wonder if it would work with leaves as well? I might have to try. It looks like you had a lot of fun both in tot school and preschool. The duplo painting is awesome! Really great ideas.